"I just think the three of us should go for a ride." Following two great teasers, Roadside Attractions has debuted the full-length official red band trailer for the holiday-themed, political comedy titled The Oath, the feature directorial debut of actor-writer-comedian Ike Barinholtz. Barinholtz also stars as Chris, who's married to a woman named Kai, played by Tiffany Haddish. The film is set around Thanksgiving time and is about a controversial White House "Oath" that turns family member against family member. Described as a "savagely funny dark comedy about surviving life and Thanksgiving in the age of political tribalism." Bring it on and all the savagery. The cast includes Billy Magnussen, John Cho, Meredith Hagner, Carrie Brownstein, Nora Dunn, Jon Barinholtz, Chris Ellis, and Priah Ferguson. I really enjoy how this trailer starts out with all the madness, and then plays back through everything. Can't wait to see this movie. You can still watch the first teaser trailer for Barinholtz's The Oath here, or the second teaser trailer here. When Chris (Ike Barinholtz), a high-strung 24-hour progressive news junkie, and his more levelheaded wife Kai (Tiffany Haddish) learn that citizens are being asked to sign a loyalty oath to the President, their reaction is disbelief, followed by idealistic refusal. But as the Thanksgiving deadline to sign approaches, the combination of sparring relatives, Chris's agitation and the unexpected arrival of two government agents (John Cho and Billy Magnussen) sends an already tense holiday dinner gathering completely off the rails. As timely as it is outrageous, The Oath is a gleefully wicked reinvention of the traditional holiday comedy for our divisive political times. 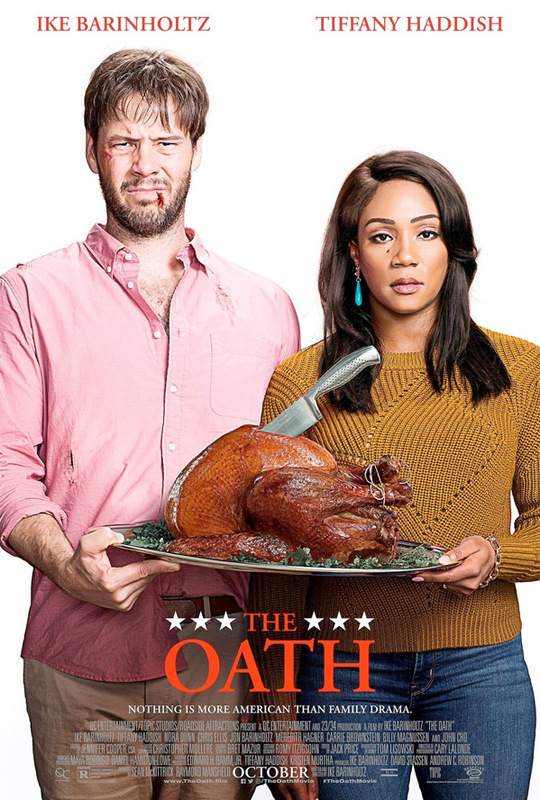 The Oath is written and directed by American actor-filmmaker Ike Barinholtz, making his feature directorial debut after directing a few episodes of "The Mindy Project" and writing the screenplay for Central Intelligence. This hasn't premiered at any film festivals or otherwise. Roadside will release Barinholtz's The Oath in select theaters starting October 12th this fall. Who's down?